It would be true to say that we currently live in the Crystal Age, because our electronic technology, and all of our modern technology is built on the power of crystals. Crystals are undeniably a physical phenomenon, commanding an extremely focused and organized chemical structure. This chemical structure sets up powerful electromagnetic capacities that affect vibrational frequency. Crystals can be used for extremely successful remote healing sessions because they are not bound by either time or space. Crystals, as healing tools, are the ideal bridge between the physical realm and the etheric realm. To understand how crystals can be used in remote healing, it is first necessary to comprehend that as living beings we have both a physical structure and an energetic structure. Our energetic structure consists of the physical body, the energy body (which is the energetic duplicate of the physical body) and the energy field, also known as the aura. Our energetic structures are not bound by time and space. We can (and do) project our energy bodies beyond the physical realm, into the etheric realm. The etheric realm is a wavelength, not a place. Radio waves, TV waves and X-Rays are wavelengths that we cannot see, but do exist “in the same space” as the light spectrum that we can see. When we switch on the appropriate equipment, the unseen wavelengths can be detected. So, when we switch on our TV, and choose the channel we want, we can watch a TV show. When we want to connect with someone etherically, we can intentionally send out a “cord” of connection, establishing a direct line of communication between one’s self and the person we wish to connect with. All manner of emotions and energies, including love and healing, can be transmitted along this cord of connection. Cording itself is neutral, but we must remember that undesirable energies can also be transmitted, both intentionally and unconsciously. When negative energy is sent, this is called “Psychic Attack,” a topic deserving its own article. For now, it is important to note that incoming and outgoing cording should be systematically cleared to avoid being an unwitting receptor and sender of uninvited energies. Alternatively, a name and photograph can be used. 2. When working intuitively, I prefer to be given as little information as possible. As I attune, and begin to pick up information, I can check that I have tuned in to “the right address.” If I have been given information before the session, I cannot be sure whether I am attuning correctly or “remembering.” To proceed with the healing session I first establish that I am attuning successfully to the recipient, so I only begin sending healing energy once the recipient confirms that my “fresh” intuitive readings are accurate. 3. It is optional for me to connect telephonically with the recipient at the time of doing the remote session. I tend to prefer to have this connection, because we can interact in real time – I can get answers to questions, get feedback about what the recipient is feeling as I’m working, and I can answer any questions that the recipient may have. It is not always possible to connect in real time, and this does not affect the potency of the healing energy. When time differences and availability issues prevent telephonic connection, an email dialog can also establish a powerful etheric connection. Establishing etheric connection can take anywhere from 5 – 15 minutes in a first session. Once this bond has been established, the etheric connection in follow up sessions flows quite quickly. 4. On my Crystal Healing Board, I use a crystal to act as the proxy for the recipient. I connect the crystal’s energy body to the energy body of the recipient. I then proceed to systematically go through all the same protocols of a face-to-face session, doing the procedures on the proxy crystal, and checking in with the recipient to ensure that she is experiencing the energy. 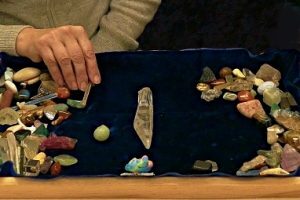 A remote crystal healing session, with telephonic connection, takes about 45 minutes. How Does the Quality of a Remote Session Compare with an In-Person Session? Obviously, the experience of a remote session is different from an In-Person session. However, the difference does not lie in the effectiveness of the session. A remote session has the advantage of purity. There are no distractions from perceiving the energy, because that is all there is to work with. This provides an opportunity for extraordinary depth and breadth in the energy work. For many people, experiencing the etheric realm, and Energy Healing, in this way, is a very moving and enlightening experience. In contrast, an In-Person session has multiple additional layers, including the physical – allowing for hands-on contact and much visual information. Indeed, I have learned, the “pure energy connection” is a very special experience.